10 Reasons Why “Contraction and Convergence” Is Still The Most Preferable Equity Framework for Allocating National GHG Targets . Perhaps the most challenging policy issue raised by climate change is how to fairly allocate responsibility among nations, regions, states, organizations, and individuals to reduce global greenhouse gas (ghg) emissions to non-dangerous levels. This problem is generally referred to as the problem of “equity” in the climate change regime. It a central issue in climate change policy formation because each government policy on reducing the threat of climate change is implicitly a position on that government’s fair share of safe global emissions. In addition, climate change will continue to get worse unless each country reduces its emissions to its fair share of safe global emissions. Therefore, “equity” is not only a challenging issue in forming climate policies, it is perhaps the most critical policy question facing the international community. This article identifies 10 reasons why the equity framework known as “contraction and convergence” (C&C) is the most preferable of all the equity frameworks under serious discussion around the world. The end of this paper will acknowledge some alleged limitations of C&C yet explain why these limitations should be dealt with in one of several possible ways while adopting the C&C framework internationally. C&C was first proposed in 1990 by the London-based non-governmental Global Commons Institute. (Meyer, 2000) ( GCI, 2009) Basically, C&C is not a prescription per se, but rather a way of demonstrating how a global prescription could be negotiated and organized. (Meyer, 1999:305) Implementing C&C requires two main steps. As a first step, countries must to agree on a long-term global stabilization level for atmospheric ghg concentrations. Although a warming limit of 2 degrees C has been preliminarily agreed to in international negotiations, subject to the acknowledged need to examine whether the limit should be reduced to 1.5 degrees C in studies that are underway, once a warming limit is finalized it must be translated into a ghg atmospheric concentration goal and then a global ghg emissions budget can be calculated. As a second step, countries need to negotiate a convergence date, that is a date at which time the emissions allocated to each country should converge on equal per-capita entitlements (“convergence”) while staying within the carbon budget. During the transition period, a yearly global limitation is devised which contracts over time as the per-capita entitlements of developed countries decrease while those of most developing countries increase. C&C would allow nations to achieve their per capita based targets through trading from countries that have excess allotments. And so the heart of C&C is the idea that justice requires that rights to use the atmosphere as a carbon sink must be based upon the idea that all human beings have an equal right to use the global commons, the Earth’s atmosphere. Because it would be impossible to achieve equal per capita emissions allocations in the short-term, C&C allows higher emitting nations to converge on a equal per capita target at some future date thus giving these nations some time to achieve an equal per capita target goal. 1. Climate change is a classic problem of distributive justice. Distributive justice holds that all people should be treated as equals in any allocation of public goods unless some other distribution can be justified on morally supportable grounds. And so distributive justice entails the idea that at all allocations of public goods should start with a with a presumption of equal rights to public goods. Yet, distributive justice does not require that all shares of public goods be equal but put puts the burden on those who want to move away from equal shares to demonstrate that their justification for their requested entitlement to non-equal shares is based upon morally relevant grounds. Therefore someone cannot justify his or her desire to use a greater share of public resources on the fact that he or she has blue eyes or that he or she will maximize his or her economic self-interest through greater shares of public goods because such justifications fail to pass the test of morally supportable justifications for being treated differently. Because C&C ends up at some time in the future with equal rights for all individuals to use the atmosphere as a sink, it is strongly consistent with theories of distributive justice. Although distributive justice would also allow for other morally relevant considerations to be considered in allocating ghg emissions that diverge from strict equality, including such considerations as historical ghg emissions levels, these other considerations can be built into a C&C framework either by negotiating the convergence dates in a C&C regime or in side-agreements on such issues as financing technologies for low-emitting nations at levels that would allow them to achieve per capita emissions limitations. C&C therefore is strongly consistent with theories of distributive justice because equal per capita emissions is the ultimate outcome of C&C even if that outcome is modified to take into account other legitimate equitable issues in negotiations by changing the convergence date or in side-agreements that finance compliance for poor nations that need assistance in achieving equal per capita emissions limitations. 2. Allocating ghg emissions on an equal per capita emissions basis is consistent with the virtually universally recognized ethical idea that all people should treat others as they wish to be treated. And so basing allocations on equal rights is the least contentious of all ethical theories of how to allocate public goods. Although there are are other ethically relevant facts that arguably should be considered in an allocation of ghg emissions such as economic capability to reduce emissions or historical emissions levels, these considerations are more controversial ethically particularly in regard to how they are operationalized in setting a numeric targets and therefore are more amenable to negotiated settlements on issues such as when convergence on equal per capita levels will be achieved rather than in setting basic allocation target levels. 3. Equal per capita emissions levels are also consistent with human rights theories about the duty to prevent climate change. That is, human rights are based upon the uncontroversial ethical theory that humans should treat each other as they would like to be treated because all people, regardless of where they are, should be treated with respect. Since the outcome of C&C is equal per capita rights, it is completely consistent with the idea of treating all people with equal respect, the foundation of human rights obligations. Because climate change undeniably violates several non-controversial human rights including the right to life, security, and food among other rights, climate change is widely acknowledged as a human rights problem. If climate change allocations are considered to be in fulfillment of human rights duties, then arguments based upon economic self-interest in setting ghg emissions targets are not an acceptable justification for avoiding human rights obligations. This is so because human rights obligations are viewed to ethically trump other values such as economic self interest or utility maximization as has been explained in significant detail in recent entries on this website. If human rights are violated by climate change, costs to those causing climate change entailed by policies to reduce the threat of climate change are not relevant for policy. That is if a person is violating human rights, he or she should desist even if it is costly to them. Therefore because a C&C framework has the strongest obvious link to human rights, if it were agreed to by the international community it would provide a strong argument against those who refuse to limit their emissions to an equal per capita level on the bases of cost to them. 4. Setting a ghg emissions target based upon distributive justice requires consideration of facts determined by looking backward, such as levels of historical ghg emissions, and issues determined by looking forward, such as what amount of the global commons should each individual be entitled to for personal use. Only equal per capita entitlements to the use a global commons satisfies future focused allocations issues without ethical controversy. And so an allocation that converges on equal per capita emissions allocations sometime in the future is more than any other allocation framework likely to be seen as universally just as far as future entitlements issues are concerned. And so, the C&C should be supported because it is most consistent with equal entitlements to use global commons resources. 5, The C&C framework is the simplest of the dozen or so equity allocation frameworks which have been seriously considered in international climate change negotiations. Because it is simpler, it will likely be easier to negotiate than the other equity frameworks which have received serious consideration. Its simplicity is derived from the fact that its focus is narrowly on climate change justice issues. Thus it is not complicated by other global injustice issues which are not climate change related yet which are considerations in some other equity frameworks . For instance, other proposed ghg allocation formula try and remedy economic injustice among nations, issues which are worthy of international attention yet greatly complicate the ethical issues which need to be considered in setting ghg targets. Because C&C is simple, it is very pragmatic. 6. Objections to equal per capita allocations have sometimes been made by representatives from high emitting nations such as the United States because of the enormous ghg emissions reductions which would be required of it to reach equal per capita emissions levels of diminishing allowable safe global emissions. Yet emissions reductions that would be required of high emitting nations under other proposed equity frameworks would be even steeper because they take into considerations issues such as, for example, historical emissions, economic wealth of nations, and ability of nations to pay. For this reason C&C holds the best chance of being accepted by the international community compared to other equity frameworks provided other issues that raise legitimate equity concerns including historical emissions levels are taken into account in some way in climate negotiations. These other justice concerns should be understood to be refinements of C&C rather than replacements of C&C because the C&C framework was always flexible enough to take into account additional issues relevant to distributive justice. 7. Many observers of international global efforts to achieve a solution to climate change argue that there has been too much emphasis on the obligations of nations while obligations of individuals and regional governments have largely been ignored. These observers argue that this focus on nations has helped high-emitting individuals and regional governments to largely escape public scrutiny. Because C&C obligations are premised on determining the obligations of nations based upon equal per capita shares, C&C can be seamlessly applied to state and regional governments and individuals around the world. 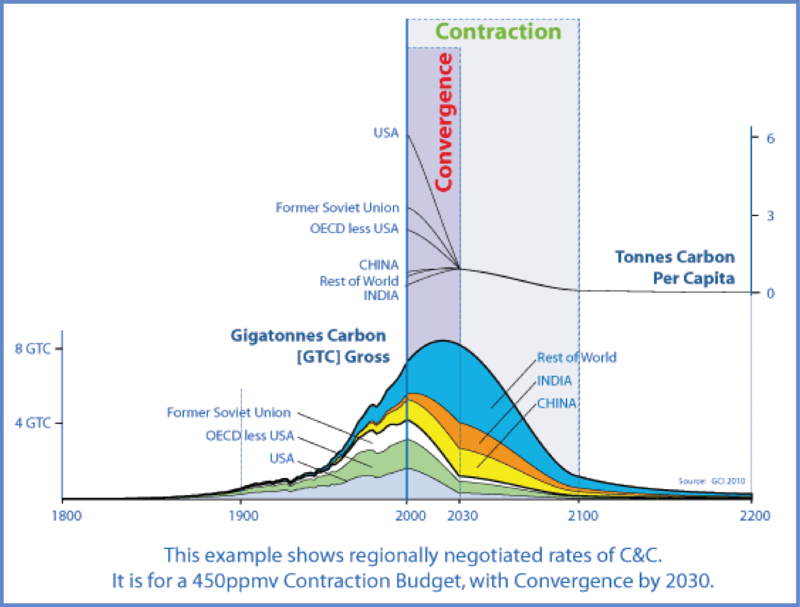 If, for instance, a C&C framework determines that the world should converge on a per capita emissions target of 2 tons per person by 2025, it is therefore a straightforward deduction to argue that all individuals around the world should limit their emissions to be below 2 tons per person by 2025 at a minimum. 8. Some of the issues that proponents of other equity frameworks have argued should be considered in allocating national emissions targets such as historical emissions or the level of economic development in poor countries are already in serious consideration in international climate change negotiation agenda focused on such matters as: (a) financial responsibility for adaptation, (b) responsibility for loses and damages for climate change, and (c) financing of climate friendly technologies for developing countries. Because of this the ethical issues raised by historical emissions or economic ability of nations to achieve a per capita allocation could be relegated to other issues already being negotiated in international climate change negotiations while emissions allocations targets are allocated on the basis of C&C. 9. 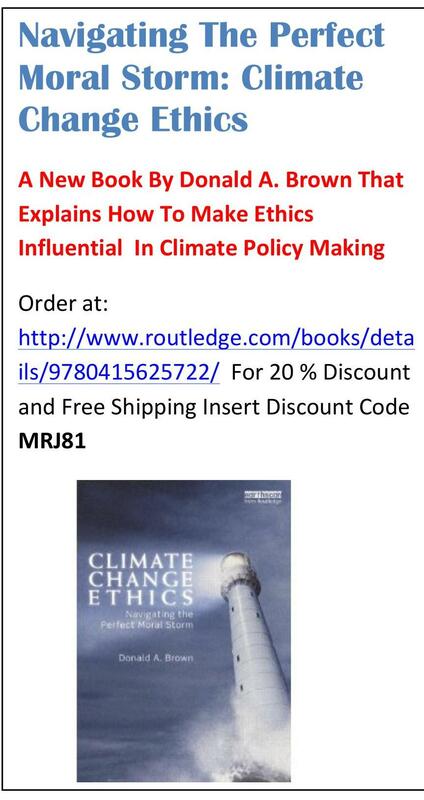 Establishing a norm that each person is only entitled to emit ghgs on an equal per capita basis would also help to draw lines about other contentious ethical issues raised by climate change such as how to count responsibility for historical emissions. Determining how to translate historical emissions into legal obligations raises a host of contentious issues including when to start counting historical emissions. This question could be simplified by first determining reasonable per capita emissions at various moments in history. In addition, determining liability for future excess emissions could be simplified if there was an agreement on acceptable per capita emissions. And so looking at the problem of climate change through a per capita lens helps draw lines about other climate change policy matters which will need to be faced. Therefore the establishment of a C&C framework would help with other policy questions that must be faced in the future. 10. Many have argued that responsibility for reducing ghg emissions should not only be based upon production of ghgs within a nation, the current presumption of international negotiations, but on products consumed in a nation but produced in another nations in processes which emitted ghgs. Although this shift from production ghg to consumption related ghg as a way of establishing national responsibility to achieve ghg emissions reduction targets is not likely to happen in the short-term, those who desire to assign liability on the basis of consumption could also use the C&C framework more easier than other proposed equity frameworks. For instance, a second allocation formula which has received serious attention by the international community is the Greenhouse Development Rights Framework ( GDR) (Baer et al., 2008). GDR was developed, according to its proponents, because C&C does not leave adequate ghg emissions to allow developing nations to develop to levels that would allow them to escape grinding poverty. And so, proponents of GDR argue that any targets developed under a C&C framework will not be fair to poor nations and therefore will not be accepted by developing nations. We agree that several additional equitable issues including the justice dimensions of historical emissions levels must be dealt with for a C&C approach to be fair to low-emitting poor countries because emissions targets simply based upon equal per capita emissions to allocate the extraordinarily small carbon budget that is left to avoid dangerous climate change will leave almost nothing for low emitting nations to grow economically. The questions is not whether these issues need to be considered in setting targets, but rather how they are considered while maintaining the moral force of equal per capita rights to use the atmosphere as a carbon sink. The Brazilian government has also developed a proposed equity framework based upon the need to take historical emissions levels seriously. Both the proposed GDR framework and the proposed Brazilian framework more directly deal with legitimate justice issues which are not expressly initially dealt with under C&C. Yet C&C can be adopted in combination with other agreements and adjustments to C&C assumptions that deal directly with the equitable issues more directly considered by the other proposed equity frameworks. For instance, the convergence dates in the C&C framework can be modified to take into consideration s0me historical emissions issues. In addition, separate agreements on such matters as financing carbon friendly technologies in poor, low emitting nations can deal with issues of need to assist developing nations achieve otherwise just ghg emissions targets. In summary, some of the alleged limitations of C&C can be dealt in other agreements while retaining the basic structure of C&C. And so, for the 10 reasons above, the C&C should be adopted by the international community not withstanding the legitimate need to consider other issues relevant to distributive justice in setting ghg emissions reduction targets including levels of historical emissions and financial ability of poor nations to comply with per capita emissions limitations. For this reason, C&C is the most preferable and practical equitable framework for allocating climate change obligations among governments.